Math Matters is a series of stories with real-life math connections. Each engaging book offers real-kid characters who confront humorous dilemmas and come up with clever solutions. Mike learns a lesson about multiplication as the dirty dishes he refuses to wash continue to stack up. Mike learns a lesson about multiplication as the dirty dishes he refuses to wash continue to stack up. Math Matters is a series of stories with real-life math connections. 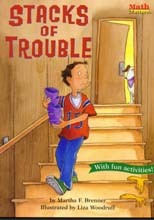 Each engaging book offers real-kid characters who confront humorous dilemmas and come up with clever solutions.